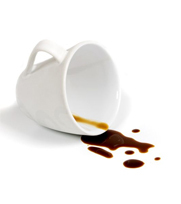 It starts at breakfast, but also during lunch at the office or when you're toasting of the weekend at Fridaynight: there is stain-danger everywhere you go! After all, a stain is made quickly. But no worries! Suitable will make you a real stain-expert, but we do not promise it will impress the ladies. Maybe your mother? Coffee, beer, wine, grease, toothpaste.. Please do not throw out your shirt, but use our tips and tricks to remove the stains! Which stain do you want to remove? A cup of coffee in the morning is part of the regular morning ritual for many people. If you are not completely awake yet, spilling some coffee on your shirt can happen in just a second. Do not panic! We can help your to get this stain out quickly. Take a little sprint to the closest tap, in the kitchen or bathroom for instance. Chances are you can just rinse the coffee out if you are quick enough. Coffee with milk is best rinsed out with cold water and coffee without milk should be rinsed out with warm water. Was the damage already done and didn’t the water help? Then choose for more drastic matters! Apply some liquid detergent (or stain remover) on the stain. Let it soak in and then wash your shirt as usual.